THE BRILLUSTRATOR: I am in OUT100! It's finally poated on the OUT website, and the magazine hits the stands today! 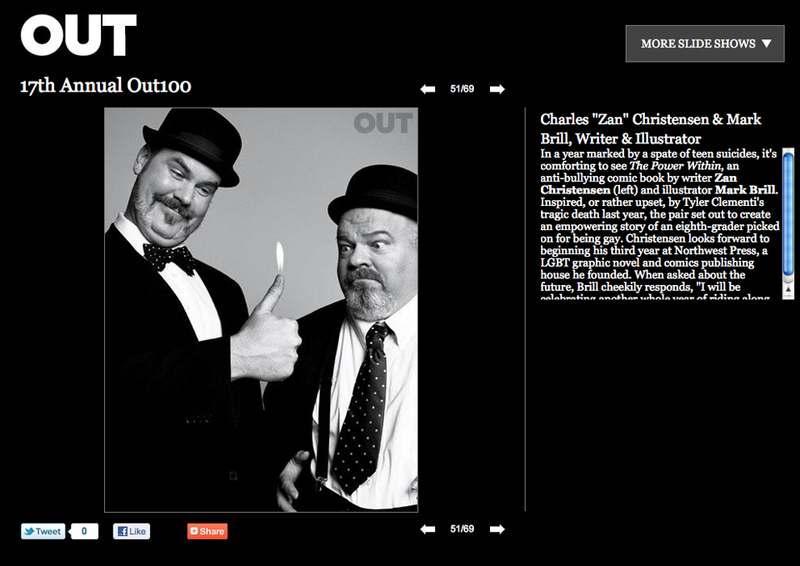 Zan Christensen and I made the OUT100 list for 2011! It's really exciting and a great honor!! 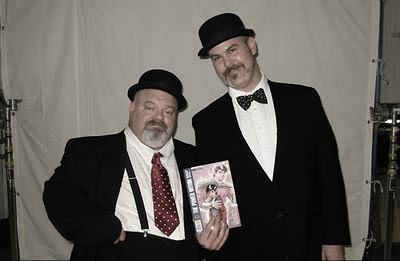 November 17, 2011—OUT Magazine revealed today that Charles "Zan" Christensen and Mark Brill—creators of the anti-bullying comic THE POWER WITHIN—have been recognized as two of 2011's "OUT 100", described by the magazine as an "annual salute to the year's most inspiring people". Other notable honorees this year include Jesse Tyler Ferguson, Sandra Bernhard, Justin Bond, Dustin Lance Black, David Mixner, Harmony Santana, Chaz Bono, and Tim Gunn. Christensen and Brill started work on THE POWER WITHIN in October of last year for 24-Hour Comics Day, an event where artists and writers attempt to create a complete 24-page comic book in 24 hours. Their story focused on a boy named Shannon who deals with bullying at school by escaping into a super-powered alter-ego but ultimately has to find the strength to face the harassment in real life. The decision to do a comic that tackles antigay bullying was prompted by the previous month's numerous reports of teen suicides linked to bullying and harassment. Those reports spurred Ellen Degeneres to speak out to raise awareness and Dan Savage to start the It Gets Better Project. "We didn't go into this project knowing where it would go," said Christensen, who scripted the book and coordinated the project. "We just felt compelled to tell a story that confronted the epidemic we saw unfolding before us and offered some hope. We're humbled to be recognized for our efforts, and hope that others will continue use their skills and their resources to change kids' lives for the better." THE POWER WITHIN was completed in Spring of 2011 and released as a limited edition black-and-white comic at Seattle's Emerald City Comic-Con, but Christensen and Brill decided to raise funds for a much larger color print run of the book and make it available for free to schools and other youth resources. Brill continued to work on the book, adding full color and additional art, while Christensen recruited special guests to contribute bonus pages to the project. The finished book contains pages by a collection of comics industry heavyweights, including Gail Simone (Wonder Woman, Birds of Prey), Phil Jimenez (New X-Men, Wonder Woman), Greg Rucka (Detective Comics, Gotham Central), Matthew Clark (Outsiders, Wonder Woman), Stephen Sadowski (JSA, Warlord of Mars), Dan Parent (Archie, Kevin Keller), Donna Barr (The Desert Peach), Andy Mangels (Gay Comics, Iron Man: Beneath the Armor) and Carla Speed McNeil (FINDER). The book was published by Northwest Press and made its debut at Comic-Con in San Diego in late July, hitting store shelves later that summer. It was well-received by readers and critics alike. "It's been really amazing—this project seems like one of those things that was just meant to be," said Brill. "I think Zan and I were both really inspired and motivated to do something positive with this story and people have really responded to it." "Gay comic creators Mark Brill and Charles ‘Zan’ Christensen have created what may be the best comic book of the year," said Andrew Belonsky of Towleroad.com. To date, Northwest Press has distributed over 700 free copies of the book to over 50 Gay-Straight alliances, schools, churches, community centers and other youth organizations across the United States and beyond. Northwest Press encourages organizations to request copies of the book to use as teaching and outreach tools. In addition to the main story and bonus pages, the book contains a page of discussion questions and resources for LGBT teens.